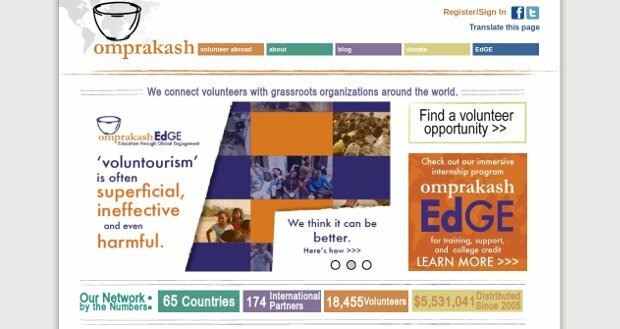 Omprakash creates transformative educational experiences by connecting grassroots social impact organizations around the world with an audience of volunteers, donors, and classrooms that can learn from and support their work. Their database links over 100 pre-vetted ‘Partner’ organizations from over 30 countries with potential volunteers and funders, all free of charge. They also offer grants to qualified applicants to defray the costs of travel and living expenses. They screen all of their Partners through a rigorous application process, and volunteer testimonials help them monitor quality throughout our network. They also facilitate honest communication : when Partners receive donations through their network, they require them to maintain transparency via their unique expense reporting tool which helps donors stay informed about their impact. They are finally educating volunteers, interns, and citizens. Their Education through Global Engagement (EdGE) program matches a rigorous online curriculum with an immersive international internship experience, leaving participants better prepared to understand and engage with local communities during their time abroad.